Type locality: Mazatlan, Sinaloa, Mexico. Altitude range: 0-500 metres above sea level. Habitat and Ecology: The species occurs in thorn scrub on the hills near the sea and coastal sand dunes together with Rathbunia kerberi, Echinocereus ochoterenae, Mammillaria beneckei, Mammillaria rubida, Pachycereus pecten-aboriginum, Opuntia decumbens, Stenocereus thurberi, Rathbunia alamosensis, Pilosocereus purpusi, Pilosocereus alensis and Acanthocereus occidentalis. The species has a relatively wide range and is locally abundant. The species is threatened by coastal tourist developments, especially in sand dune habitats and close to the Pacific Ocean. Mammillaria occidentalis var. monocentra (R.T.Craig) Backeb. Mammillaria mazatlanensis var. occidentalis (Britton & Rose) Neutel. Ebnerella occidentalis (Britton & Rose) Buxb. Mammillaria occidentalis (Britton & Rose) Boed. Mammillaria mazatlanensis f. sinalensis (R.T.Craig) Neutel. Mammillaria patonii var. sinalensis (R.T.Craig) Backeb. Mammillaria mazatlanensis f. patonii (Bravo) Neutel. 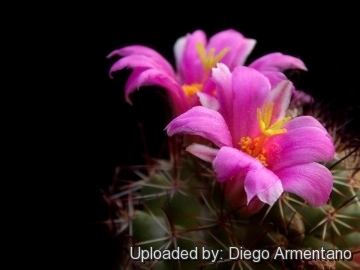 Description: Mammillaria mazatlanensi is a cylindrical cactus, with reddish brown spines and large bright purple flowers with green stigmas. The plants are commonly cespitose, often forming broad clumps with many heads. Two subspecies are recognized, the nominate form and subs. patonii. Stems: Oblong to slender-cylindrical, greyish-green, 4 to 15 cm long, about 2-4(-5) cm in diameter. Tubercles: Terete, short, softish, rather cone-shaped, 3 to 4 mm long, without latex, their axils usually naked or with one or two short bristles. Radial spines: 12 to 15(-18), slender, needle-like, setaceous or bristly, spreading, white 5-10 mm long. Central spines: 1-4(-6), stouter than the radials, reddish brown, ascending, 8 to 15 mm long upper ones in the same plane as the radials, the lowermost typically or predominantly straight, sometimes more or less strongly hooked. Flowers: From the axils of the old tubercles but towards the top of the plant, tubular, 3-4 cm long, 3 cm across, pink to carmine red to bright purple; perianth-segments oblong, spreading; stigma-lobes 8 green, very long and slender. Fruit: Club shaped, to 20 mm long, brown, becoming reddish yellow. Mammillaria mazatlanensis K.Schum. ex Gürke: has 1—3 central spines, 12-18 radials, and pink to carmine red to reddish purple flowers. Distribution: occurs throughout the range of the species. Mammillaria mazatlanensis var. monocentra R.T.Craig: has a single brownish-red central spine about 7 mm long, straight or slightly bent to form an incomplete hook, and 15-16 white radials. Distribution: Yaqui Valley, Sonora, Mexico. Mammillaria mazatlanensis subs. patonii (Bravo) D.R.Hunt: has 4 central spines, 13-15 radials, and bright purple flowers. Distribution: Tres Marias Islands off the coast of Nayarit, Mexico. Mammillaria sinaloensis (Rose) Mottram: is the hooked spine form of Mammillaria mazatlanensis. Distribution: Sinaloa and Southern Sonora, Mexico. 6) Arreola, H. 2013. “Mammillaria mazatlanensis.” The IUCN Red List of Threatened Species. Version 2014.3. <www.iucnredlist.org>. Downloaded on 07 May 2015. 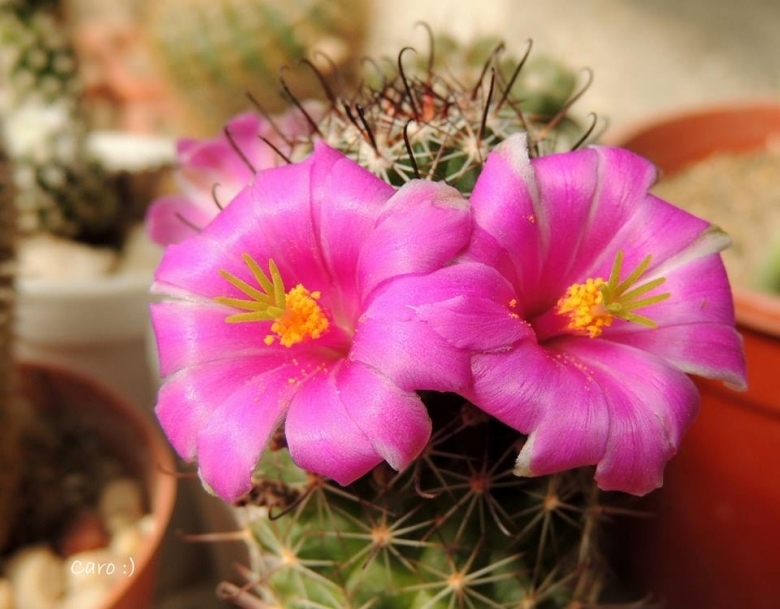 Cultivation and Propagation: Mammillaria mazatlanensis is somewhat difficult to cultivate. During the summer it is best to keep the plants outside where the temperature can rise to over 30° C with no harm to the plant, recommended for any collection that needs lots of light with ample airflow. Repotting: Repotting every 2-3 years. As it is especially prone to rot under-pot in a smaller container filled with very porous compost. Use pot with good drainage. Seeds germinate in 7-14 days at 21-27° C in spring, remove the glass cover gradually as the plants develops and keep ventilated, no full sun for young plants! The seedlings should not be disturbed until they are well rooted, after which they can be planted separately in small pots. Cuttings: wait until the offsets that appear at the base of old clustered specimens are 1/3 the size of the parent and then detach and plant. Cuttings will take root in a minimum temperature of 20° C (but better in hot weather). Cuttings of healthy shoots can be taken in the spring and summer. Cut the stem with a sharp, sterile knife, leave the cutting in a warm, dry place for a week or weeks (depending on how thick the cutting is) until a callus forms over the wound. Once the callus forms, the cutting may be inserted in a container filled with firmed cactus potting mix topped with a surface layer of coarse grit. They should be placed in the coarse grit only; this prevents the cut end from becoming too wet and allows the roots to penetrate the rich compost underneath. The cuttings should root in 2 to 6 weeks.